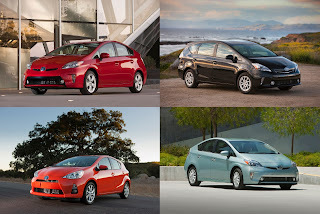 Toyota’s Prius-badged vehicles proved to be the most popular new vehicles with California drivers during the 2012 calendar year. According to R.L Polk, the Prius family cars (Prius Liftback, Prius v, Prius Plug-in, and Prius c) accounted for 61,893 vehicles registered in California, making Prius the No. 1 vehicle badge sold in the state. This continues the trend shown by the state’s consumers who are adopting gasoline-electric hybrid technology and putting more of these vehicles on the road. With 236,659 units of the Prius family sold throughout the US in 2012, California accounted for 26.2% of all US Prius family sales for the year.